What should six appointed trustees of our taxpayer-funded library do with Ann Skovek’s $1.3 million donation? So far, they’ve decided to renovate our 6 1/2 year old building–with no community capital expenditure vote–and last night they held the first Public Design Charrette. In January. When no one is here. With minimal, if any, advertising of the public forum. Seven library patrons attended the meeting. In October 2007 our community approved a $7.8 bond for a brand new library. Along with the $1.3 million donation, appointed trustees have amassed nearly $3 million more primarily tax dollars that sits as cash in the library’s bank accounts. That’s after every year requesting budget increases but continuing to pay library employees subpar wages (objectively, compared to other LI libraries, one reason why a union was overwhelmingly voted in in August 2015). Detail above is from the June 2016 Library Audit, available on the library’s website. When asked about the additional monies set aside for the capital projects above, Library Director Danielle Waskiewicz said that money was collected so that the board wouldn’t have to go to the taxpayer to ask for more money when it’s needed and, not to worry, all that extra money is contract district money anyway. Where to begin? How disingenuous can we be? First of all, taxpayer money is taxpayer money. Period. Secondly, when money is collected it all basically goes into one big pool. Is the source of every tax dollar (WH/WHB/Remsenburg, etc.) labeled and then spent or saved? No. Third, taxpayers approve a big bond and then they’re robbed annually for lots more money to be spent any way appointed trustees want that money to be spent, with no community voting? I feel deceived. Fourth, it’s our money! We should be asked how we want it spent. Fifth, taxpayers who fund the library should be permitted to participate in trustee elections so the community can hear what others would like to do–taxation with representation. As it stands now, three eligible taxpayers are willing to serve on the board–and the private closed club of appointed trustees are denying them entrance to that club. I respect and applaud fiscal conservatism and it’s great to save for a rainy day. 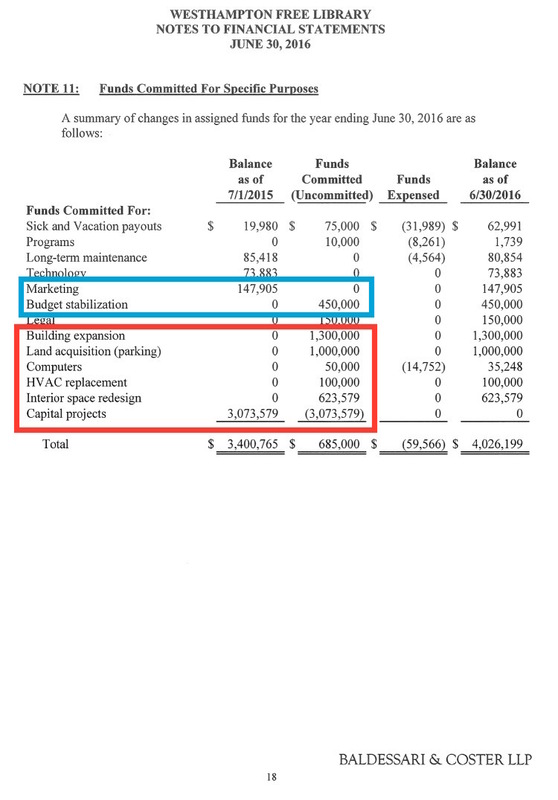 But how big does that slush fund for our appointed trustees and director need to be? H2M Architect Patsy Chang presented three options for the $1.3 million donation. 1) Do nothing. 2) and 3) Attic renovations. Ms. Chang designed this brand new library a few years ago. In her presentation last night–her words–she highlighted numerous times all the “wasted space” and inefficiencies in our library as it currently stands, and why these renovations would be useful. This is our hard earned money that you’re talking about!! Our money that was “wasted” not that long ago. A bigger building requires more daily and annual upkeep and maintenance. Costs more to operate. Costs more to staff. It’s not just the initial $1.3 million outlay. Bottom line–maybe I’d be more amenable to a library renovation strictly using the donation if we had an elected board of trustees and if the employees were compensated fairly and if they were a priority before the building.